Sam and Dad had made a kite. They’d made it large. They’d made it light. They went out on a windy day to see if they could fly it. Sam can’t wait to try out the new kite, but Dad says he’s too small – this kite needs someone bigger. Dad launches the kite himself, and a strong wind pulls it into the sky. But the wind is so strong that it pulls dad up, too! Who can rescue this runaway kite? Sam knows! We were quite thrilled to receive a review copy of this new children’s book which will be published by Clarion Books this coming March. 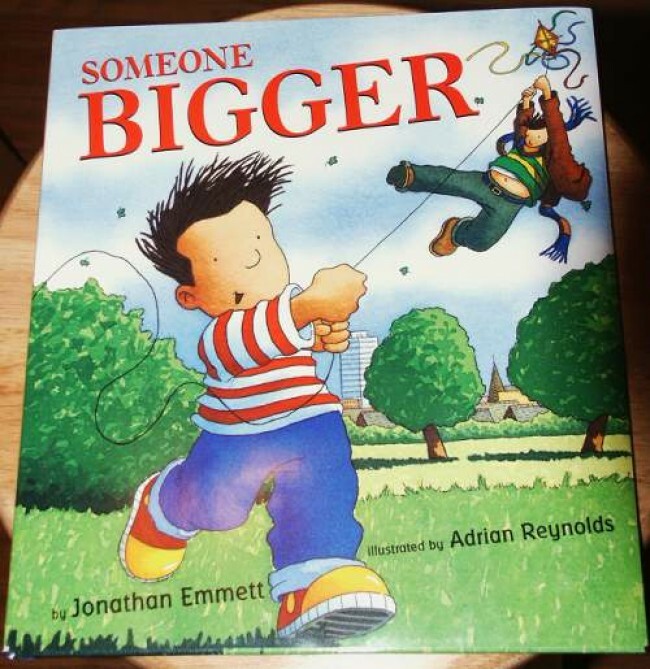 Author Jonathan Emmett’s bouncy text is perfectly matched by the cheery, humorous artwork of illustrator Adrian Reynolds. Their whimsical kite adventure touches on a familiar childhood frustration, but proves – to the delight of children everywhere – that “someone bigger” isn’t always “someone better”! Jonathan Emmett is the author of several books for young people, including Bringing Down the Moon, illustrated by Vanessa Cabban, A Turtle in the Toilet and A Mouse in the Marmalade, both illustrated by Caroline Jayne Church. Adrian Reynolds has illustrated more than twenty books for children. They include four books in the Pete and Polo series, which he also wrote; the Baby Loves books by Michael Lawrence; and the popular Harry and the Dinosaurs stories by Ian Whybrow. Scheduled for release this March, you will be able to order this book from your local book store, or contact Clarion for a nearby retailer… Suggested retail is marked at $16. This entry was posted in 2004, Issue 34 (Jan/Feb), Kite Books, KL Archive and tagged book, emmett, review.